I’ve been quilting for five years and have never made a quilt for myself. 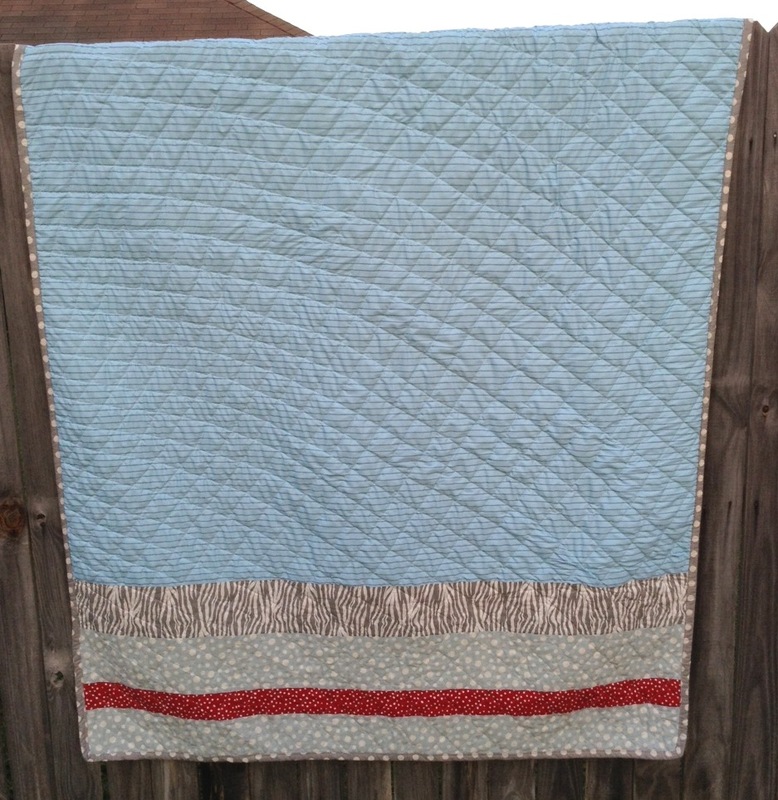 Meet my Sentimental Log Cabin Quilt. It’s sentimental because I used scraps from past quilts that mean a lot to me. 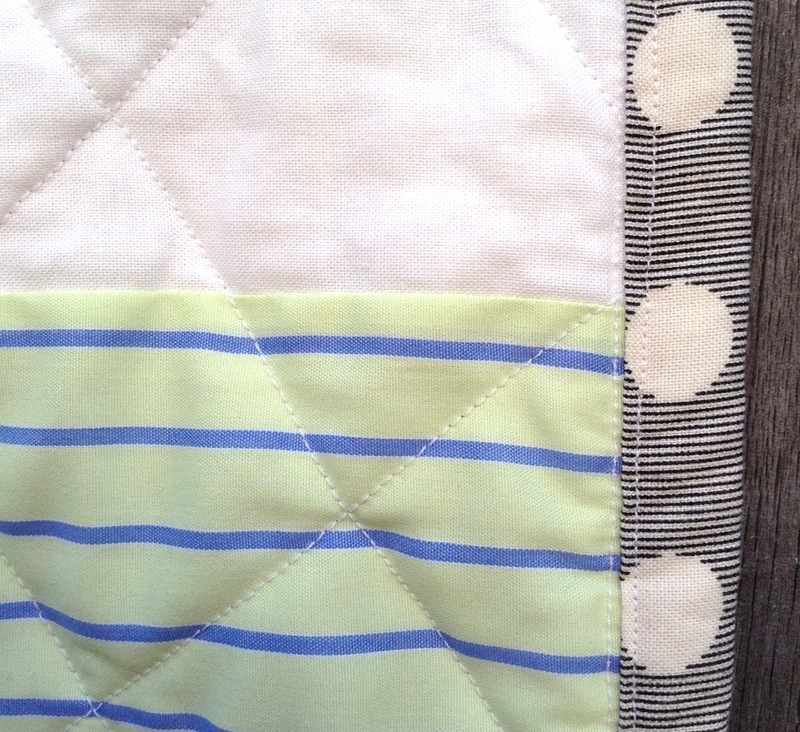 The blue polka dot on the center of each square, along with the zebra print, are from Wrenn’s first quilt. 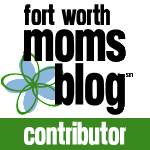 The green and blue striped squares, along with the blue backing, are fabrics that Mr. Right brought me home from his trip to India. The red polka dot stripe on the back is from my nephew Jack’s quilt. And the gray binding is from my mom’s quilt. This was my first log cabin quilt. I loved it. 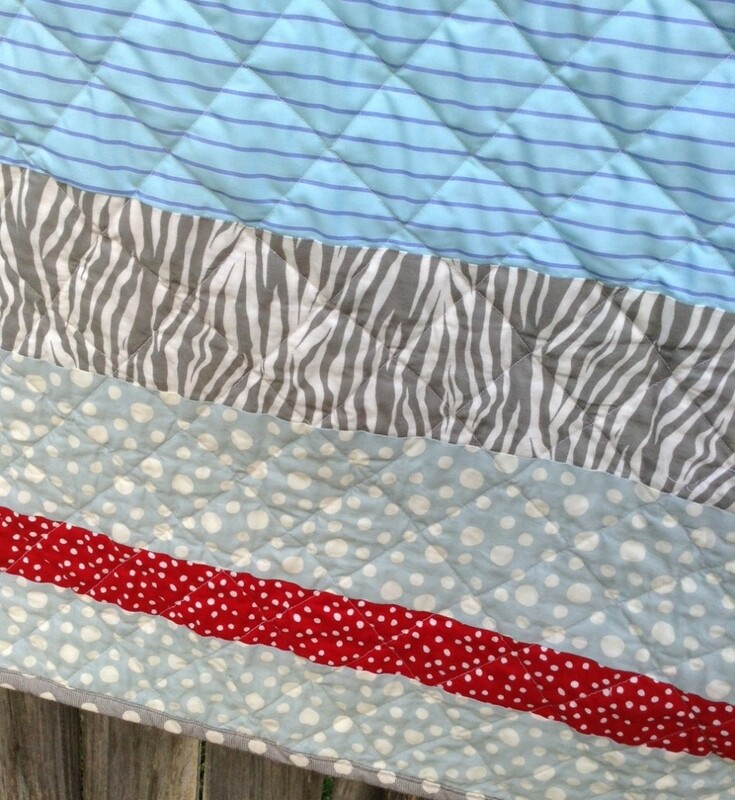 I took a jelly roll and cut each strip of fabric long-ways and then just started piecing. I did the log cabin squares while about 11 months pregnant, and then pieced the rest of the quilt and finished it after Baby Girl was born. 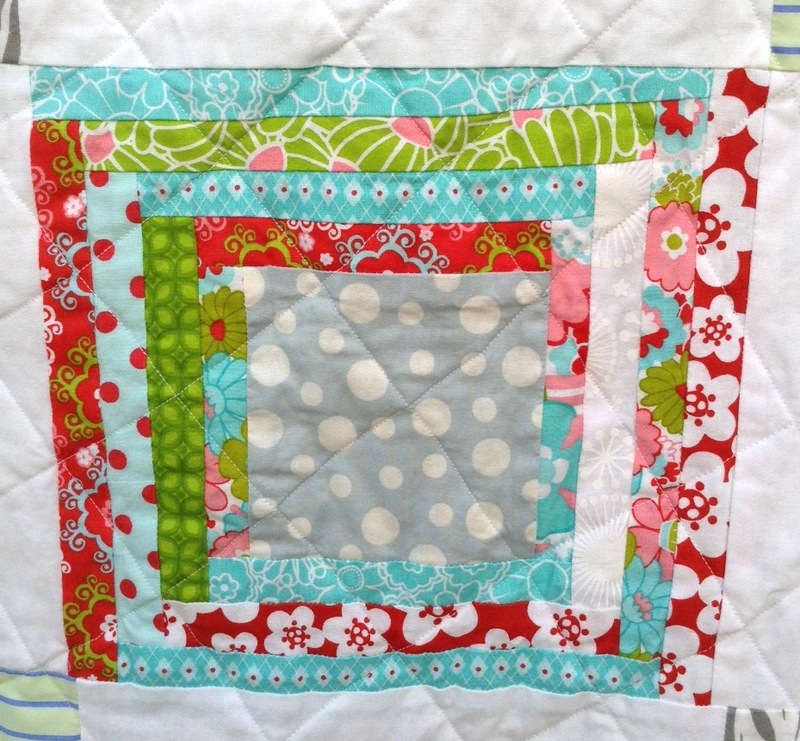 Quilting has changed now that I have a sleeping baby in a bouncy seat sitting next to my machine. As an aside – I read that babies grow used to certain sounds in the womb and those same sounds don’t bother them once they’re born. I’m starting to think it must be true because Wrenn sleeps right through the sound of my sewing machine, which is pretty loud. She also sleeps through the dog barking, but certain, less familiar sounds will wake her up with a jerk. It’s so fascinating. 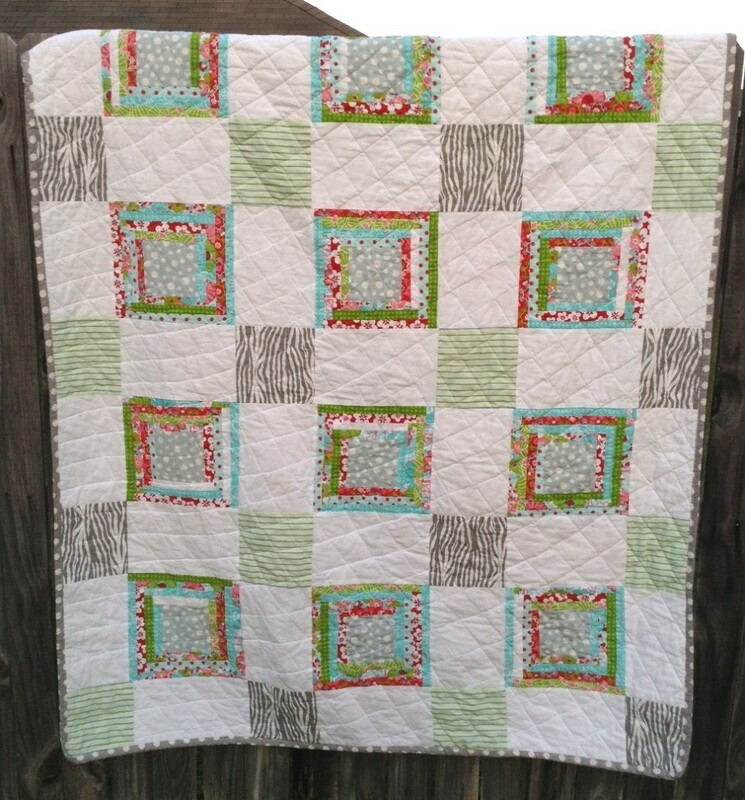 Back to the quilt… I quilted it on the diagonal, and I love the way it turned out. I didn’t draw out my lines before quilting, which means that there are a lot of imperfections and crooked lines, but lesson learned. Besides, I tend to think that small imperfections are what make homemade quilts so special. If I wanted perfect, I’d just buy a mass-produced one at the store. But that’s boring. I pieced the back because I didn’t have enough blue fabric to cover the whole back, and I love the way it turned out. I’m starting to love pieced backs more than plain ones these days. Again, each one of those fabrics holds special meaning to me. I haven’t measured it yet, mostly because I have a squirmy 8-week-old baby who is sitting in my lap as I type this, and I just don’t want to put her squishy little self down. It’s the size of a large throw – I’ll be using it to snuggle under while I watch TV on the couch. Mr. Right already has one I made for him, so now everybody in this house has their own, just in time for the cold fall weather to hit. And that’s my Sentimental Log Cabin Quilt! Now that I’ve made myself one, I’m getting greedy and thinking about another one I want to make for our new bed. Oh, I didn’t mention our new bed? Stay tuned to find out why God wanted me to have a king-size bed. It’s a good story. Also, coming next week, another give-away. Who doesn’t love some free stuff? I’m linking up with Crazy Mom Quilts’ Finish It Up Friday. I’m so glad you finally make yourself a quilt! It’s fun to wrap up in your own creation. Nice Job! What a charming finish. Love the binding. I, like you have been quilting for five years or there abouts, but unlike you I’ve made myself four quilts so far and two WIPs that will also be for me. My family also have plenty to. Enjoy your lovely quilt made just for you.